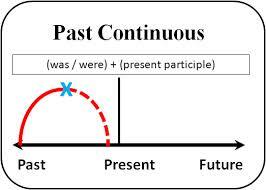 This post will show you how to form the Past Progressive (also called the Past Continuous). To see how to use the Past Progressive, click here. We were walking to the store. They/You (plural) were playing tenis. You weren’t waiting for us. She/He/It wasn’t driving very fast. We weren’t thinking about the consequences. They/You (plural) weren’t sleeping at 8:00 am. Were you living in Sidney? Were they writing their essay? When was he working there? How were they saving money? Why were they changing jobs?